Keynote - Kevin Johnson, President, Platform & Services Division, Microsoft - Kevin Johnson oversees Microsoft's Windows and Online Services businesses, as well as sits on Microsoft's Senior Leadership Team, setting overall strategy and direction for the company. In this keynote, Kevin will cover Microsoft's aspirations in the search and online advertising space, including the roles of Live Search and MSN. We're focused on four core businesss: - Our desktop business - Our enterprise business: Windows server, etc. - Our consumer electronics business - XBOX, etc. - Our online business - and the center of this is the advertising platform. The more inventory you have, the better you can deliver. It's a scale of economics. It is a software problem. There are algorithms that will determine what ad to serve to improve the buy-sell process. We have software that provides workflow. It also is an area that requires a significant investment in capital. When you look at the industry, we believe that the industry will be better served if there are n number of players where n>1. We're invested and committed to provide choice for advertisers and publishers and consumers. Danny: Is there a danger that Google will be so entrenched that you're unable to compete? Kevin: Google is already entrenched so you need to have disruptive ways to change the paradigm. We need to innovate on the horizonal relevance of search and the navigation. We want to amplify verticals that relate to commercial intent. We want to connect buyers and sellers. We're going to be thoughtful about the fact that we have an entrenched competitor but we need to deliver an innovation to grow our share and to build our value in the market. Danny: What's the most innovative thing you've done? Most disruptive? Kevin: We have had image search, voice related search for innovation. We integrate Farecast. We have Cashback. We want to do things that are good for merchants and advertisers. We're innovating on the user and business model side to differentiate the product to benefit the advertisers. Danny: Talk to us about the Cashback program. Are there results? Kevin: The team monitors it everyday. People are on top of that on a realtime basis. But over a year ago, we had a concept that said that commercial intent search is connecting buyers and sellers. Why is it that the middleman keeps the money? Maybe we should reward the consumer for the action. This concept of cash back has been conceptualized for over a year. We had Live Search Club to test consumer loyalty. In launching it, we had 2-3 points of growth in share in a 60 day period. It was a different model but it was a test to see if customer loyalty would work in the long term. That led us to the Jellyfish acquisition and leading this to a commercial experience. We want to change the paradigm of the model and it needs to be in conjunction with the user experience. Danny: Any other loyalty programs we're likely to see? Kevin: We're going to see a continued focus across three major verticals (entertainment-video, commercial intent queries/shopping, reference) and a braod horizontal (broad relevance and capability for navigation). The first way to amplify this is around commercial intent. As we improve Cash Back, we'll make it a great value proposition for the consumer. Danny: What's the biggest obstacle in getting people to use your search product? Kevin: The brand, Google, is a very strong brand. People think that Google = search. We need to differentiate the product experience. We need to get users to try it so that the user experience can create a brand perception. Then we need to do marketing that reinforces the brand perception. Danny: What's the biggest advantage? Kevin: Commercial intent queries make about 30% of search queries but it makes up 80% of the revenue, so we need to keep carving out paradigms for this. Danny: What's Google's weakness? 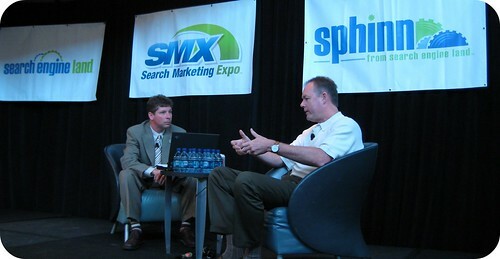 Kevin: The user experience hasn't changed much, and they're used to those 10 links. That's their Achilles heel. But in terms of what we want to do, we need to be different and innovate. I think there's a new paradigm that consumers will want and will embrace and it's up to us to be able to deliver on this. Danny: There's the Live brand. Why not go back to MSN or Microsoft Search? Why not change it - or will it change? Kevin: There's an opportunity for us to fix those brands. We acknowledge that we need to get that fixed. If you have suggestions, we'll take them. Danny: Does fixed mean change? Kevin: Fixed means fixed. We need to send money to build it. Danny: What about the Yahoo acquisiton? Kevin: We need to discuss alternatives that are not a full combination that has some positive attributes to it and we'll see where that dialogue leads. Danny: Where else are you looking to make changes? Kevin: You think of distribution broadly. You can get it with service providers, PC manufacturers, downloads, etc. We're going to work the full range of those alternatives. Some are better than others to enable the user to try and experience live search but it's a combination of distribution and good marketing. To do good marketing, you need to have your brand stand for something. In some sense, you need to leave with the user experience and get distribution so that people are trying it. All of those activities are underway. We need to make clear differentiation in terms of commercial intent. Danny: What about Firefox's search default and drop down box? Only Google and Yahoo are there. Kevin: We want to give the consumer choice. You can set your default of Live search and I think that IE provides a better experience. Danny: Do you think that search is being overcredited for conversion occurring online or do you think it's undercounter? Kevin: Search provides line of sight metrics and analytics for the advertiser and that's a wonderful thing. We want to provide engagement mapping - providing line of sight and applying it to display ads and rich media ads. Why is that? The advertiser to have that view can balance their media and see the best way to drive conversion (whether display ads, rich media, search, etc.) Engagement mapping embraces a bunch of elements and puts it in a framework. Danny: Speaking of Live Search Books - if search is a long term game, Google is already scanning all these books. Microsoft said that you wanted to do that and you said it was a centerpiece of what you're doing but then it went away last week. Kevin: Being able to crawl the web and index books is still valuable. What we did in our book scanning product is that we scanned 750k books. We're going to continue doing this, but because of the advanced tools and because 1st party publishers are embracing tools to do it themselves, we're going to crawl and index so people will still search and find. Having an open approach is important in putting the publisher in control of his/her content. We'll certainly be there to help them do their scanning but the fact is that the industry is maturing and we think more publishers will already be doing it themselves. Danny: What about the Google/Doubleclick acquisiton. Shouldn't you do what they did and split the search company off? Kevin: When we acquired aQuantive, we also got Avenue A:Razorfish. Our principle is to operate it at arms length - as an independent agency. We think this makes our ad platform better. We've signed up over 100 publishers including Facebook and Viacom and Digg and many others. Our company has been built in partnership. The fact that we want an ecosystem that people can make money is still true in the advertising platform. We want them to grow and thrive and have a healthy business. Danny: What's Microsoft's tagline? Kevin: We're working on a search and display platform that can provide choice for the industry. We have software services that are monetized with online advertising and some that aren't. Danny: What do you think of the progress? Kevin: We want to get more publishers and inventory. That inventory has been related to display and video. We need to strengthen search. That's a reflection of search query volume and share. If we can carve out the commercial intent queries, that's going to be a very positive thing for the ad platform. Q&A: What improvements are being easier to use - perhaps an offline editor? Kevin: Last September, I was at ad week in NY and I worked to get their feedback. Some people said the tools need to be easier. Some said that we need to submit keywords that don't take so long (shortened cycle times). The third was getting more inventory. That was the feedback that I took personally from that trip and with adCenter we continued to release improvement. We're launching an offline tool this week - that's one step in the process. Microsoft is the man and Google is the way to get at the man - how do you address this perception? Kevin: In any industry, choice is good. We want to give choice to consumers, publishers, and users. We need to innovate. What about Gatineau? Are you going to be able to ramp it up? Can you give it a better name because people can't spell it? Kevin: Feedback noted.